The image on the left from NASA's Chandra X-ray Observatory shows the first double-sided X-ray jet ever detected from a young star. A similar jet may have been launched from the young Sun and could have had a significant impact on the early solar system. The young star, named DG Tau, is located in the Taurus star-forming region, about 450 light years from Earth. The bright source of X-rays in the middle of the image is DG Tau and the jet runs from the top left to the bottom right, extending to about 70 billion miles away from the star, or about 700 times the Earth-Sun separation. A detailed analysis of this image, led by Manuel Guedel of the Institute of Astronomy, ETH Zuerich in Switzerland, shows that the counter jet (top-left) has, on average, higher energy X-rays than the forward jet (bottom-right). 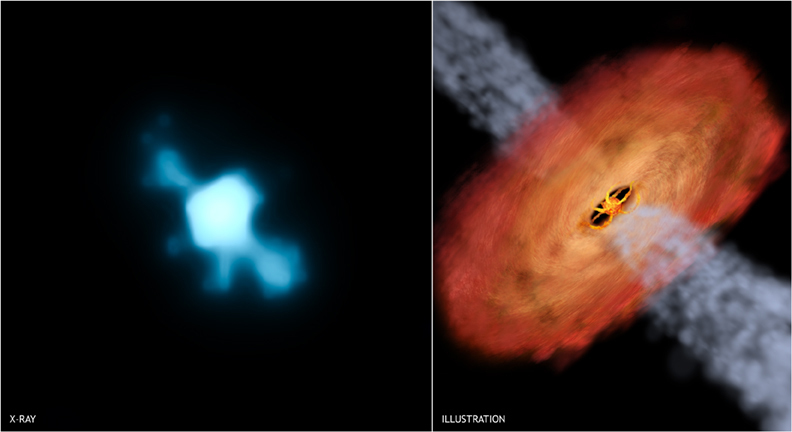 The likely explanation is that some of the lower energy X-rays in the counter jet are absorbed by a disk around DG Tau, as shown in the accompanying illustration (right graphic), showing the star, disk and the inner regions of the jets. Highly energetic X-rays are also detected from the young star, partially absorbed by streams of material flowing from the disk onto the star. The disk itself is much too cool to be detected by Chandra. Note that the faint vertical feature below the star does not show evidence for an additional jet, but is a chance alignment of four photons. The effects of the jet on its surroundings may be significant. Other researchers have previously suggested that X-rays from a typical young star can significantly affect the properties of its surrounding disk, by heating it and creating charged particles by stripping electrons off atoms (a process called ionization). These X-rays will strike the disk at a low angle, mitigating their effects. In the case of the jets from DG Tau, the combined X-ray power in the jet is similar to that of a young star with relatively modest X-ray brightness, but X-rays from the jet have the advantage of striking the disk much more directly from above and below. Guedel and colleagues argue that powerful X-ray jets might develop at some stage during the evolution of most young stars. They could, for example, have existed during the early stages of the solar system. DG Tau has about the same mass as the Sun, but is much younger with an age of about one million years, rather than about 4.5 billion years. Since it is surrounded by a disk where planets may be forming, this new Chandra image suggests that the early Earth and its environment may have been bathed in X-rays from a jet like DG Tau's. Although it is unknown if such X-rays would have had a significant impact on the forming Earth, it is possible that they did more good than harm. By ionizing the disk the X-rays may have generated turbulence, which could have had a substantial effect on the orbit of the young Earth, possibly helping to prevent it from making a disastrous plunge into the Sun. Furthermore, X-ray irradiation of disks may also be important in the production of complex molecules in the disk that will later end up on the forming planets. The new X-ray observations of X-ray jets add new features to the already complex story of star and planet formation. The ionization and heating power of the X-rays rom jets will have to be included in future model calculations that will help scientists understand the physical evolution and chemical processing of environments that eventually lead to planets like those in our solar system. Scale X-ray image is 24.5 arcsec across. Coordinates (J2000) RA 04h 27m 04.70s | Dec +26° 06' 16.30"